Read the Aspen Hill Scope of Work or view the presentation slides. 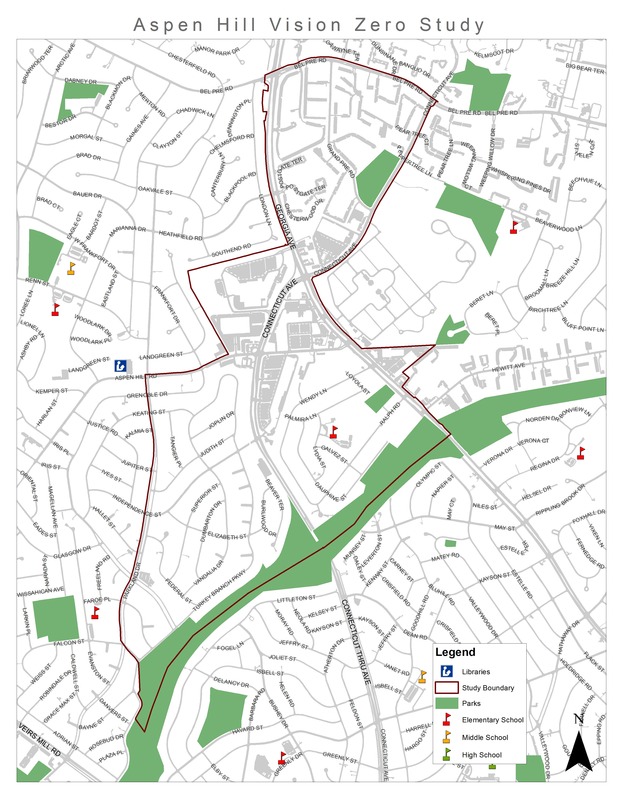 The study area includes the land area between Georgia and Connecticut Avenues that extends north of the intersection to Bel Pre Road and south of the intersection to Matthew Henson Park. This area has high numbers of collisions per square mile. Commercial developments within the study area are concentrated near Georgia Avenue, Connecticut Avenue, and Aspen Hill Road, including Northgate Shopping Center, Aspen Hill Shopping Center, Aspen Manor Shopping Center, and stand-alone Home Depot and Kmart stores. 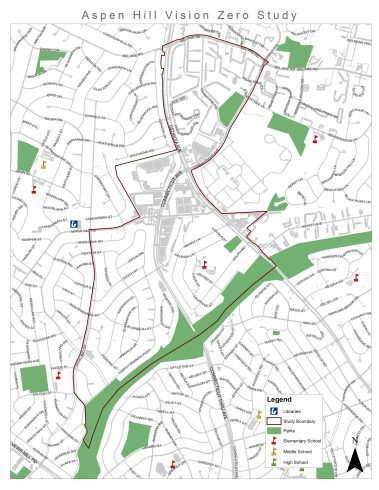 During the planning process for the 2015 Aspen Hill Minor Master Plan Amendment and the Veirs Mill Corridor Master Plan, community members expressed interest in an update to the larger 1994 Aspen Hill Master Plan. Pedestrian safety at major intersections has been a common concern. In 2016, Montgomery County adopted Vision Zero and committed to eliminate severe traffic injuries and fatalities by 2030. Under Vision Zero, policy makers and designers work with local stakeholders to ensure safety for all people as they move about their communities.